I've added a new image of the blogosphere to the gallery. It is repeated below. The image is a hyperbolic projection of a graph of the largest 8 partitions (connected components) - the data is a combination of that from WWE2006 and from our upcoming ICWSM2007. The visualization is centered on DailyKos. 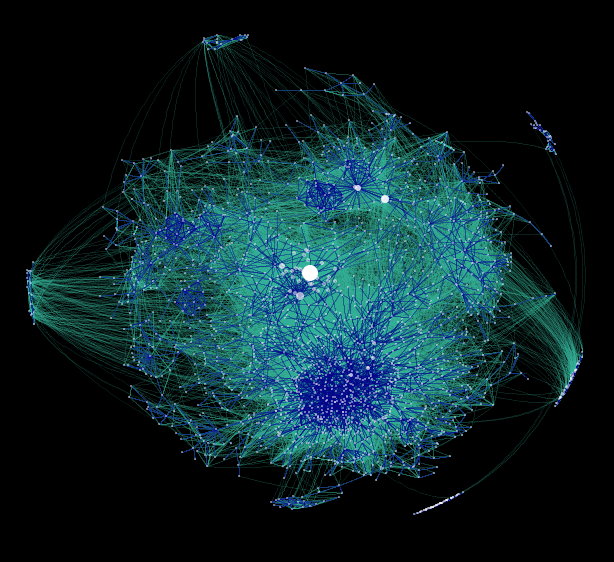 The highly connected area below centre is the socio/political community. Above and to the right is the heart of the technical blogosphere with BoingBoing being the brightest node. Interesting. Snowball sample? Are these permalinks, links within posts, or both? This is really beautiful. What are the outliers - the little sattelites around the edges? Are hosts like Blogger visible? Most importantly - how do I find musicthing.blogspot.com ! Elia, what I'd really like to do is provide some sort of annotations. Perhaps an api like Google Maps would be pretty cool allowing users to zoom in and see the labels on the blogs once a suitable resolution has been achieved. Any chance we can get some annotations on this? At least with some of the big stuff labeled? TIA for help from anybody. I'd like to get something with annotations - I'll try to make that the feature in the next edition. Thx. I'll check it out.